One of our best selling programs of all time! Watch detailed, narrated coverage of the rebuilding of a huge, modern steam locomotive to mainline standards. Here's a fascinating 2-hour look at one of the most interesting mechanical procedures in the history of the industrial age...the complete rebuilding of a huge railroad steam locomotive. Over a period of 18 months, Goodheart cameras looked on as the 261 crew painstakingly restored this beautiful locomotive for passenger excursion service. 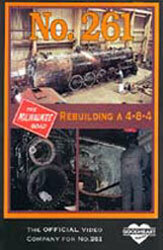 The story - most of it told by the workers themselves - not only describes the overhaul, but also explains how a steam locomotive works.